The Verdict Is In! 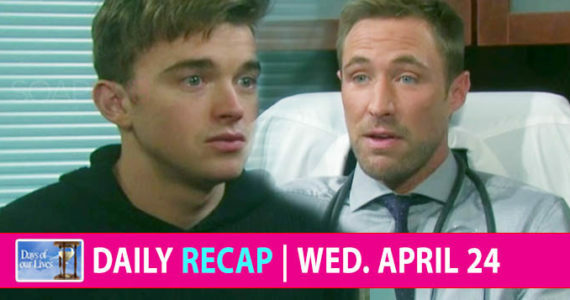 Should Eric Quit Judging Sarah On Days Of Our Lives? Judge not lest ye be…we all know how that goes, and former Days Of Our Lives priest Eric should know that proverb best of all. Yet, that hasn’t stopped Eric (Greg Vaughan) from judging Sarah (Linsey Godfrey) for sleeping with Xander (Paul Telfer), and reconciling with Rex (Kyle Brandt) after he slept with Mimi (Farrah Fath)…and Sarah’s sister, Noelle. He’s a former priest, 45% of you remind, he should be less with the judging and more with the forgiving. Or God will be mad at him. Besides, there’s also the minor fact that what Sarah does is none of Eric’s business. They knew each other for only a few weeks, and Eric was still grieving for Nicole (Arianne Zucker) at the time, so it’s not like he was exactly in his right mind and making great decisions, either. Hey, remember how he killed her brother, 28% of the audience is rushing to remind. Sure, Daniel was a bad idea all the way around and nobody really wants to remember he existed – not that Maggie (Suzanne Rogers) will ever let us forget. Oh, and also we don’t know if Sarah even ever actually met the man. But that’s not the point. Eric got him killed. So maybe he should sit himself back down and be quiet. Heck, no, 24% counter, Sarah and Eric may not have known each other for a long, but she definitely tried to seduce him and, when he turned her down, she definitely went out of her way to hurt him, first with Xander… and maybe even with Rex, too. Hold her responsible, Eric! Make her pay!